Relations between the two Asian countries have long been poisoned by the memory of Japan's colonial rule over Korea in 1910-1945. It is believed that Japanese companies forced prisoners of war as well as local residents into hard labor for the Japanese military industry during the occupation. In accordance with the 1965 Japanese-South Korean agreement, Tokyo paid compensation for the damages inflicted on South Korea. In 2018, the South Korean Supreme Court made the Japanese companies Mitsubishi Heavy Industries and Nippon Steel & Sumitomo Metal pay compensation over the use of forced labor during World War II. The companies refused to do so, and Seoul, in turn, decided to seize a part of Nippon Steel’s assets in South Korea, triggering Japan’s criticism. The issue of so-called comfort women, a term used to describe women forced to work in wartime brothels in occupied territories for the Japanese military during World War II, is yet another old wound in the bilateral relations. With the exact number of women involved in the practice still the subject of debate, most of the women were taken from countries occupied by Japan between 1932 and 1945, mainly Korea, China and the Philippines. Tensions around a shared history are likely to further escalate this year, which marks the centenary of the March 1st Movement, a series of protests calling for independence from Japan’s colonial rule that took place across Korea in 1919, Dr. Deokhyo Choi, a lecturer at the University of Sheffield's School of East Asian Studies pointed out in his comments to Sputnik. "There will be a lot of historical events related to the history of colonial Korea. So, history issues will surface in South Korea, and this might send a wrong message to Japan by inflaming popular anger within the Korean society regarding history issues, using history to blame Japan and the Japanese government," Choi said. The expert noted that decades-old grievances were unlikely to go away soon due to the unwillingness of Tokyo to engage in a full-fledged dialogue on giving compensation to South Korea's surviving comfort women and victims of forced labor. 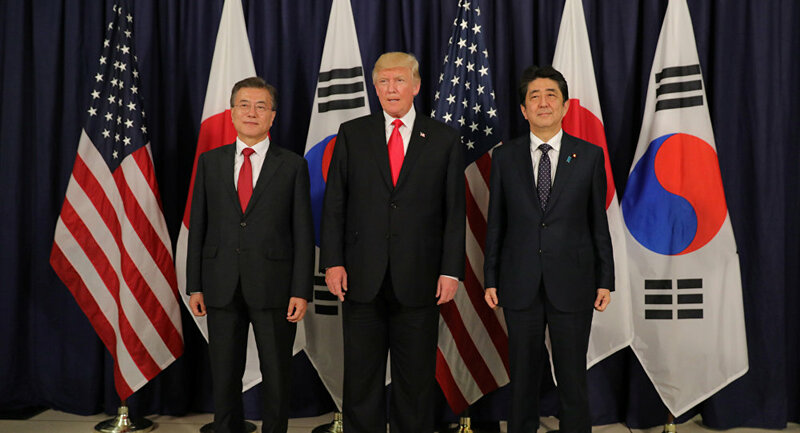 "Both leaders recognize that they have to do something, for example, by creating a fund to support or compensate for the victims, but I don’t think it will happen soon, as long as either side, especially the Japanese government is not willing to have dialogue with the South Korean government," Choi said. The relations between the two Asian nations have further deteriorated following a series of military incidents in which Seoul and Tokyo exchanged accusations of a deliberate provocation. The spat began in December with an encounter between a Japanese patrol aircraft and a South Korean navy destroyer. Japan claimed that a South Korean navy destroyer locked its fire-control radar on a Japanese patrol aircraft. Seoul meanwhile rejected the claims and instead said that the Japanese aircraft conducted a low-altitude flight that posed a threat to the South Korean ship. The military row further escalated in late January after a Japanese maritime patrol aircraft reportedly flew close to a South Korean warship in the Korea Strait. As tensions continue to grow, the commander of the South Korean Navy’s First Fleet, Rear Adm. Kim Myung-soo, called off his planned February visit to the Japanese Maritime Self-Defence Force's Maizuru District facility, while Tokyo canceled a port call by its Izumo destroyer in South Korea's Busan slated for spring. Professor Jeff Kingston, the director of Asian Studies at the Temple University Japan, told Sputnik that the two countries were unlikely to bury the hatchet in the foreseeable future. "Both think the other owes them an apology," Kingston explained. Nevertheless, the two countries are unlikely to engage in further military tensions, Choi pointed out. "I do not think that the Japanese and South Korean governments will escalate possible military tensions," he said. Despite being historical adversaries, both Tokyo and Seoul are part of an alliance with the United States, which the authorities of each country state to be of vital importance for regional security. The decades-long disagreements along with the most recent military incidents indeed affect bilateral relations, but hardly affect more wider intra-regional relations and the overall security situation, James Edward Hoare, a research associate at London's School of Oriental and African Studies and former UK diplomat, highlighted in his comments to Sputnik. "These tensions have marked relations between the two countries for so long that they have minimal effect on wider relations. Most of the time the inter-state issues have not stopped Japan and the ROK [South Korea] working together on other issues, setting aside the historical differences," the expert told Sputnik. He noted, however, that the bickering between Washington’s two key allies in the region limited their trilateral cooperation on regional challenges, such as China's and North Korea's nuclear program. "The scrap between the two means that they cooperate less on apparently vital issues such as relations with the North [Korea] or with China than the US government would like, which probably makes their alliances with the US less effective than the latter would like," Hoare said. Kingston agreed, noting that Washington was dissatisfied with the confrontation between Seoul and Tokyo that hindered the alliance. "The US has long been unhappy that unresolved grievances from the past have limited defense cooperation and sabotaged plans for leveraging the trilateral alliance to mutual advantage," the expert said. Kingston pointed out, however, that whereas former US leader Barack Obama attempted to reconcile Japan and South Korea, President Donald Trump appeared to be "asleep at the wheel." Views and opinions, expressed in the article are those of the contributors and do not necessarily reflect those of Sputnik.